In the delightful international hits Apres Vous and Priceless, French writer/director Pierre Salvadori delivered his own unique spin on Francis Veber style mistaken identity paradigms and early twentieth century Hollywood screwball romantic comedies. Yet while separately the two oddball characters of a depressive musician who walks away from success and a housewife pushed to the brink of insanity by the appearance of a crack in her living room wall might have inspired two very different and worthwhile narrative endeavors, there’s little if anything holding Salvadori's fragile Courtyard together besides the charm of actors Gustave Kervern and Catherine Deneuve. Not bothering to delve very far into his characters’ backstories or pay off on the musical background of the main lead (who might as well have been a telemarketer), Salvadori and his co-writer David Léotard overwhelm the already threadbare plotline with an endless parade of eccentric characters that continually pull focus away from the two leads. And though it’s been given an impressive transfer to Blu-ray high definition, the film is often reminiscent of an unfunny sketch comedy. While it doesn’t need the romantic glow of Vous or the ritzy polish of Priceless level luxury apparent in his earlier Lubitsch-like comedies, Courtyard is devoid of much needed warmth and energy thanks to its overly washed out color palette, largely uninspired edits, and fly-on-the-wall style cinematography. 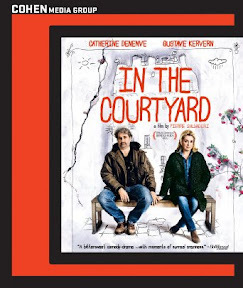 Fascinated by the potential of symbolism and allegory, while Salvadori infuses In the Courtyard with some refreshing moments of situational humor (as opposed to his former standby rapidfire wit), this melancholy dramedy is far too bitter than sweet or even bittersweet. With the songs of Stephin Merritt’s Magnetic Fields and the spirited performances serving as the film’s saving grace, you can’t help but think how much stronger the work could’ve been if it had taken a cue from Once or in God Help the Girl and put the musical plotline to good use. Uneven, messy, and relentlessly downbeat, while In the Courtyard marks an ambitious attempt for Salvadori to develop an old idea in a new way and move beyond his winning screwball comedy formula, in the end it's a gamble that fails to pay off. Not cut out for a life riding the rails as a modern day hobo after he ran away from home, in the eighth season premiere of The Big Bang Theory we check back in with Sheldon Cooper (Jim Parsons) only to find him uncharacteristically pantless and alone. A clever reintroduction to the show's four-time Emmy winning MVP, the opening sequence serves offers the highly-verbal Jim Parsons a rare opportunity to give his mile-a-minute wit a rest and let his physical comedy skills shine through. 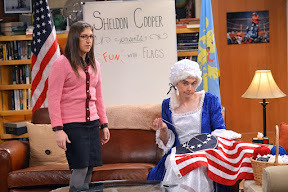 A success masqueraded as failure, not only does the first episode illustrate how far Sheldon Cooper has come since the very start of the show but – given his season-long journey from external to internal vulnerability, it also makes an intriguing bookend – foreshadowing where The Big Bang Theory will leave him in the most mature season of the CBS hit so far. An instantly iconic image in a series that continually strives to top itself, the sight of a helpless Sheldon Cooper wandering around in his drawers is just the first in an endless parade of set-ups and plotlines for Parsons to navigate through in during its nine month span. Still as entertaining as it is, once you laugh your way through another inventive twenty-four episode installment only to discover that one of actor Kunal Nayyar's biggest dilemmas of the entire season is when his character Raj accidentally breaks a drawer, it's hard to ignore the way that the show's dueling drawers serve as a study of comedic contrasts in more ways than one. Saddled with the divorce of his bickering parents and a beautiful if downright creepy girlfriend (played by the talented Laura Spencer), once again Raj is largely left out of the main events, serving up reliable volleys of witty line reads from the sidelines in B and C subplots throughout the season as Big Bang's most underutilized performer. Returning to the formula that fueled the show’s earliest seasons for a few of the biggest episodes of the year, while other cast members are similarly overlooked in favor of storylines surrounding the three original leads (including underrated, versatile pro Johnny Galecki and consistently charming Kaley Cuoco), season eight tries to share the wealth a bit more than before. With Leonard (Galecki) and Penny (Cuoco) on stable ground at long last, Big Bang has ramped up its emphasis on the rollercoaster relationship between Sheldon and his long suffering gal pal, Amy Farrah Fowler, thereby necessitating scene-stealing actress Mayim Bialik to deservedly graduate to the show's fourth lead. And after years of playing well off one another to augment their unique brand of chemistry, those behind Bang's scenes have made the refreshingly big decision to capitalize on the strong bond between Simon Helberg and Melissa Rauch as Howard and Bernadette Wolowitz, leading to some of the season eight’s most memorable scenes. A nice change of pace from the relationship woes of Leonard and Penny which had usurped way too much time earlier in the series run as the millennial version of Friends' Ross and Rachel, giving Howard and Bernadette their share of the show's A-storylines fills the two with a newfound confidence and offers Sheldon, Leonard, Amy, Penny, and Raj the opportunity to explore new comedic terrain. Mercifully backing off a bit on Bernadette’s clichéd yelling, Big Bang’s recalibrations help prepare us for the show’s increasingly dramatic tone, resulting in a number of surprisingly multifaceted episodes in the last half of the eighth season. Although in the past, Big Bang occasionally overwhelmed the subplot concerning the dominance of Simon Helberg's Howard by the women in his life with "To the Moon, Alice!" Honeymooners style hostility that at its worst came off as misogynistic and mean, by now the series realizes it is tonally at its best when it goes for just the right blend of sour and sweet. 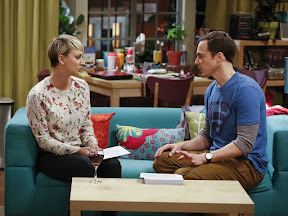 Delivering its fair share of teary laughs, in season eight Big Bang handled the unexpected heartbreak of Howard regarding the loss of his perpetually offscreen mother (to reflect the real life passing of actress Carol Ann Susi) with particular grace in a series of unexpectedly moving episodes that also hint at future storylines for the couple in the coming years. Frequently compared to fellow Warner Brothers series Friends which appears to have helped lay the structural groundwork for the series in terms of juggling three to four subplots or conflicts per twenty minute episode, while Big Bang Theory does adhere to its predecessor's passion for holiday episodes, relationship twists, and season-ending cliffhangers, to its immense credit, Chuck Lorre and Bill Prady's series stays true to its own unique roots. 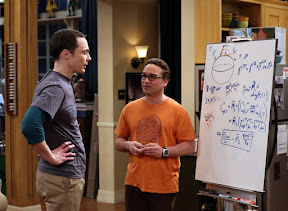 Ensuring that science will always play a fundamental role, one particularly compelling plot arc this time around focuses on a collaboration between Sheldon and Leonard which wins them both admiration and an internet troll. But although The Big Bang Theory centers on a group of characters with extraordinarily high IQs, its most authentic material is still derived by the challenges they face in everyday life. Thankfully understanding that one of the best friendships on the series is between Sheldon and Penny, season eight gives us one of the duo's sweetest endeavors in which they undertake an experiment to fall in love. Moving beyond mere questions of romance, now that their characters are a little older and wiser, many begin to ask themselves the tough questions. In addition to the death of a loved one and the collapse of a business, the ensemble begins making plans for the future while taking stock of their lives, including Penny who goes from aspiring actress/halfhearted waitress to taking a stable job and begins working from nine to five. While obviously its characters are more well-adjusted than they were when the series started thanks largely to the women in their lives (and in the underwritten Raj's case the long-overdue ability to talk to them without alcohol), The Big Bang Theory has certainly come a long way since it was originally dubbed "beauty and the geeks" and centered on Penny as its sole female voice. This being said, it still gets plenty of mileage out of the group's devotion to a science fiction fanboy lifestyle by way of a hilarious run-in with security at Skywalker ranch, an epic ping pong battle for a replica TARDIS, and Sheldon and Amy's first boy-girl G-rated sleepover in a living room fort. However after years of watching the Big Bang boys' adventures, some of this season’s most original plotlines focus on the adventures undertaken by the show's trio of far more courageous girls, whether they’re embarrassing themselves in Penny’s apartment or testing their limits in Vegas. While its laugh track can feel a little canned at times, there's something wonderful about its dedication to situation comedies of the past. Refusing to follow current trends like everyday mockumentaries or thirty minute dramedies designed to represent faux reality TV, The Big Bang Theory remains one of the best classically structured contemporary comedies on network TV. Proving that the best way to remain current is to continue building its characters while also switching up the A and B story leads, although it occasionally recycles plotlines from years' past given its demanding twenty-four episode run, there's far less filler here than we typically see on most rival network series. 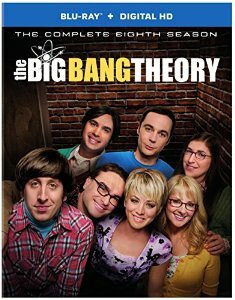 Newly released on Blu-ray, Digital and DVD to coincide with the return of Fall TV, once again The Big Bang Theory reminds viewers why its number one in its category with a two-disc sharply executed season of high definition comedy that's largely top-drawer.